You’re in the mood for pizza, but waiting for delivery is annoying; your toothbrush is worn out, but you don’t want to go to the store; you’re planning to propose to your girlfriend, but finding something unique takes time. The solution to all of those things: 3-D printing. The International Consumer Electronics Show (CES) is the annual unveiling of worldwide tech innovations for us to behold. 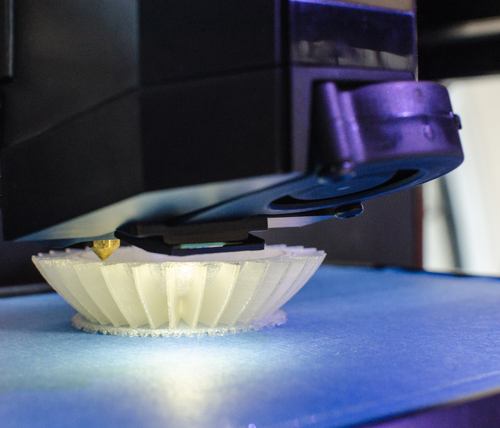 3-D printing and its “You thought it couldn’t be done and boy, did we prove you wrong” future was presented at this year’s show as one of the top five tech trends to watch in 2015; for the lowdown, read on. In 1984, Charles Hull (who would later co-found 3-D Systems) had the idea of three-dimensional products built by following a digital data file; this launched the beginning of what leading manufacturer of seals and sealing devices Apple Rubber calls a disruptive form of technology. By the end of 2014, biotech company Organova was printing and selling liver tissue for commercial use. The company hopes to be printing entire organs in the next few years. In 2008, the RepRap company released the first 3-D printer capable of printing almost all of its own components. This reduces the costs of parts, thus enabling consumers to 3-D print everyday products and gifts in their own home. Later that year the first person in history walked on a prosthetic leg that was entirely 3-D printed. Organova released the first 3D-printed blood vessel in 2009 and, over the next few years, developed gold, silver, a car and even an airplane via a 3-D printer, proving that the possibilities of this incredible technology were endless. Then in 2013 the blueprints for the first successfully tested 3-D-printed gun were released to the public for download off the internet, which is highly controversial and poses a huge threat to the already-sensitive topic of gun control. In 2014, the AR-15 semi-automatic rifle was printed and now poses concern that background checks will not be performed on gun owners; plus, the printed firearms do not have serial numbers, making them completely untraceable. In a TED Talk featuring Bastian Schaefer, he predicted that within the next five to ten years, the general public will be able to purchase prescriptions and blueprints from an online pharmacy, have the appropriate materials shipped to you and 3-D-print out your pills. Artificial body parts will be 3-D-printed: a 3-D printed ear has already been released. Meat and leather products will be 3-D-printed, without killing a single animal. And the ultimate printed product? Your own 3-D-printed iPhone. It’s being discussed, and they already 3-D-print the cases. Behold and embrace your 3-D-printed future. It’s only going to get bigger.